A study found smartphone use while driving continues to be an issue in the United States, but Apple's introduction of Do Not Disturb While Driving last year has made a small difference, reducing the amount of iPhone use while at the wheel by approximately 8 percent. According to analysis by insurance comparison site EverQuote in its Safe Driving Report, approximately 92 percent of drivers in the United States use their smartphones behind the wheel. Analyzing usage of the EverDrive safe driving app, approximately 88 seconds of the average 21-minute journey is spent on mobile devices. Driving without due care and attention can be deadly, with the National Highway Traffic Safety Administration advising that taking five seconds to look at a smartphone is the equivalent of driving the length of a football field while blindfolded. 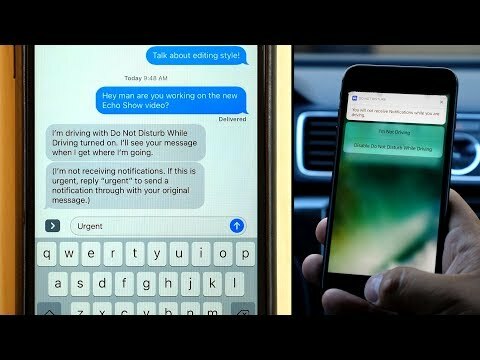 To counter the dangerous habit, Apple introduced Do Not Disturb While Driving, initially introduced at WWDC 2017 and shipped as part of iOS 11. The feature automatically detects if the user is driving and automatically blocks notifications from appearing onscreen until the end of the journey. User data from more than half a million EverDrive installations suggest that most iPhone users embraced the feature at the time of its introduction. From September 19, 2017 to October 25, 2017, EverDrive detected Do Not Disturb While Driving was active on 80 percent of iPhones during the period. Approximately 27 percent of users disabled the feature after initially using it. Of those who kept Do Not Disturb While Driving enabled on their devices, EverDrive noted phone usage while driving decreased by around 8 percent. While not a major reduction, it is still a sign that the feature's addition is helping to lower the number of times drivers are distracted during transit. A survey of EverDrive users for both Apple and Android devices revealed 41 percent were not aware there was any form of Do Not Disturb While Driving feature available to them. For those who did, 75 percent believed it made them safer drivers, while 15 percent didn't believe it was the case. How to use Do Not Disturb While Driving on an iPhone. Apple's Do Not Disturb While Driving is able to detect if the user is in a car, via Bluetooth or USB connections to the vehicle's in-car entertainment system, or by detecting motion. Passengers who are not driving are able to continue using their devices by tapping an on-screen button confirming they are not in control of the vehicle. The feature prevents drivers from seeing messages and call notifications displayed on the screen, with automatic responses able to be sent back to the sender warning that the user is driving, while "favorite" contacts are still able to break through the block. Features like CarPlay, navigation, and music playback will continue to work as normal. Before the feature's introduction, Apple was under pressure from critics to add a similar function, and has been the subject of a number of lawsuits. In 2016, Apple was accused of failing to install a "lock-out" facility into FaceTime, one that was claimed could have prevented an accident from late 2014 that led to the death of a five-year-old girl. An attempted class action lawsuit in January 2017 made similar allegations, claiming Apple put profit before customer safety over the missing feature. In August 2017, another suit brought by the father of a college student killed by a texting driver in 2013 was thrown out of court with prejudice, with the judge reasoning the blame stemmed from the driver's neglect of their "duty to safely operate" the vehicle, and it was unreasonable to say Apple was ultimately responsible for the incident. If you have CarPlay you can receive and send messages without ever having to take your eyes off the road or hands off of the wheel. In a time where even a cheap car is $20k, including CarPlay should not be that big of a deal. In a time where even a cheap car is $20k, including CarPlay should not be that big of a deal. Are you suggesting that everyone should buy a new car just to get CarPlay? Are you saying that every car that's $20k+ has CarPlay? What $20k automobiles have CarPlay? You should look how often people tend to buy new cars, what happens to cars after their original owner gets rid of it, and what percentage of automobiles actually offer CarPlay before suggesting that "it's no big deal." Not sure if this is something the only works in the US or not but when Do not disturb while driving is on I still receive every notification. Settle down, guy. He was saying that cars aren't cheap ("when even a cheap car is $20k"), so -- if manufacturers want to keep people safe -- they should include CarPlay ... since people are already paying, you know, $20k. I'll agree on this, neither of my families cars have CarPlay and we won't buy new ones until they start to need more than standard maintenance which could be several years. When we do purchase our brand new vehicles and only those that have CarPlay will be considered. There is of course a large amount of the population that does not replace their old car with a brand new one, but buys a used vehicle instead. It will be at least a decade more before the majority of cars being purchased will have CarPlay capability. I don’t have a car payment right now and my car runs just fine. No it doesn’t have more than Bluetooth but I don’t care, I’m not going to buy a new car just to get CarPlay support. Not worth it. My next automobile will depend heavily on the availability of CarPlay with a heavy lean toward wireless CarPlay. A built-in inductive charging pad would be great, but it's easy and cheap enough to get one for a cup holder on Amazon so that's not a dealbreaker. That means no Tesla Model S in my future since it seems like they'll never offer CarPlay or Android Auto. I’m not going to buy a new car just to get CarPlay support. Not worth it. But will CarPlay be a core feature when you do finally buy a new car? Anyone out there who knows how to let very specific messages come through? While blocking all the others while driving? I don't think anyone is asking you to, but when you go to buy a new vehicle, wouldn't it be worth it to make sure it does have something like this? Have you ever used it, or just seen videos on YouTube? Using it in the real world is different from watching a YouTube video. Its something you need to experience yourself. I can only see both Android Auto and Apple CarPlay getting better and better. I know this is quite hard in today's world, but I think we also need to get past this just because a text came in, doesn't mean we have to respond to it right away. What did we do 10yrs ago when texting wasn't a thing? The earth still rotated, your friends were still there, the sun still rose the next day because you weren't in contact with someone 24/7/365. I'm just a guilty as the next person, but I think its something we somehow need to correct. How? I have not a clue! Actually the feature to send & receive texts without looking is Siri Eyes-Free and it's not dependent on CarPlay. It requires a compatible BT head unit, but many more support it than CarPlay which requires a compatible touchscreen head unit. The idea that you would have to buy a new car just to get CarPlay is ignorant of reality -- aftermarket CarPlay head units has been a thing for years. You've likely read and commented on articles about this very topic, as they've been covered both here and on MacRumors which you participate on, so really not understanding your narrative. I have Bluetooth in my car but not CarPlay so I just activate the Do Not Disturb While Driving feauture but customize the message and let it do it’s thing until I get to my destination. It’s sad seeing everyone and their brother constantly texting while driving. Seriously, your life isn’t that important that you need to mess with the safety of the others drivers on the road because you lack self-control. Plus even if you have CarPlay you’re still taking your eyes off the road to read the message. The LCD screen isn’t located in the windshield! I want Apple's ultimate anti-distraction device: the self-driving car. Come on, Project Titan! Can all cars get aftermarket head units? I'm not sure mine could with how everything is built into the dash and where all the knobs and buttons that control it are located, not to mention everything that it controls besides entertainment options. If this isn't standard—not interns of look, but in terms of button and knob mapping and display sizes—I wonder if it ever could be.